Continuing my preocupation with these cheap little metal figures I finally got my review of the 20 pack posted. Great deal and very convenient. 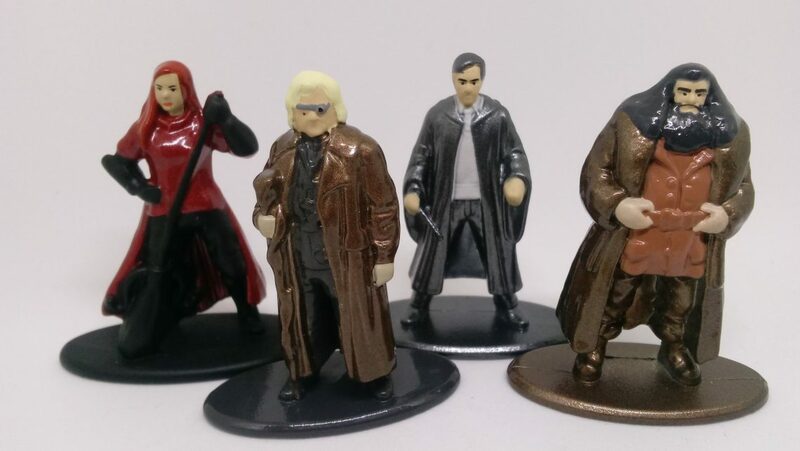 I'm most pleased about these 4 figures, as Ginny, Neville, Moody and Hagrid are currently not available outside this set. Particularly interesting to me was that the back of the box has some pictures that clearly deliniate which figures are availble singly now and which will be part of wave 2. Still looking for the ideal set of rules for Harry Potter wargaming but I've got some solid leads from THW, Ganesha and others. So will you be running a Harry Potter game at Little Wars next year? Excellent, thanks for posting these. I am working on the same project. For rules I might use Frostgrave. Or something homebrew. Magic in Harry Potter seems like it is pretty reliable, not like most rules where there is a substantial chance the wizard will fail to cast a spell at all. Instead, spells are easy to cast, but can be blocked pretty readily with other spells. I wasn't aware of the 20 pack. My 12 year old daughter is a HP fanatic. When I was a kid I used to play a microgame called Wizard from Steve Jackson's metagaming concepts. This was a good magical combat system that I think would be perfect for Harry Potter. It had a companion called Melee for non-magical combat. Both of these games were part of Metagaming's The Fantasy Trip RPG system. Glad you folks found it useful. If you're looking for this one at Target check the pop culture area against the wall in the music and movie section. That's where it is in Target's around here. I'd be interested to hear what you come up with if you make HP work as a wargame. Phil, I'l look into Metagaming as well, though I'm thinking really simple rules for this game. Probably won't be running it at LW, but it might get run at my kitchen table!